The RAF is pretty big on anniversary schemes for its aircraft that this includes biggies like the C-130. 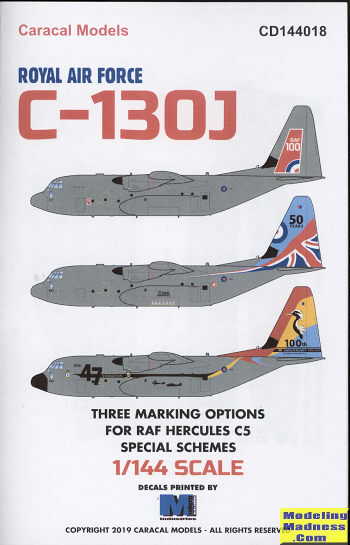 Two different versions of the C-130 J were purchased, the streched Hercules C.4 and the standard Hercules C.5. This sheet is for the latter variant. The instructions state that all the aircraft are painted in an overall dark green and while the decal placement guide sure looks like AMC grey, this photo by Liam Daniels shows that it is, indeed, a green. Note also that apparently the color fades rather quickly. The repainted areas on the upper fuselage are where the air refueling probe goes/went. Note also that I found photos of standard planes in the AMC grey scheme so apparently these were repainted during the first major overhaul. There are sufficient insignia for one of the three options. 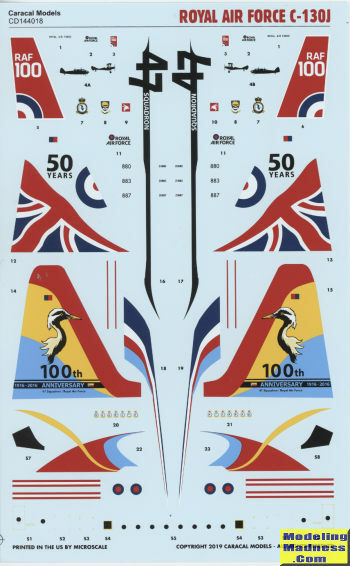 Wing walk markings can come from the kit decals. This sheet includes the black antenna decal for the base of the fin so you won't have to paint that. The red/white/red stripes are so you can use them for prop tip markings if you don't want to paint these in place. For photos that may help your build, you are directed to their web site. This set of markings is superbly printed by Microscale so you know you are getting the best.